Distribution of planets in the horoscope tells us something about the dynamics of the person´s personality, about how he or she uses life energy, and in what direction. The shape of the horoscope tells us something about the person´s inclinations. This insight into overall human character is based on Gestalt psychology. The shape of a horoscope can tell us something about recurring inclinations of a person and there are certain advantages and limitations associated with each shape. It is good to be aware of our limitations and inclinations, understand them and try to overcome them by using our abilities (as the horoscope suggests). This is one of the psychological challenges on our path to self-identity. The shape of the horoscope may not be clearly visible in the horoscope. 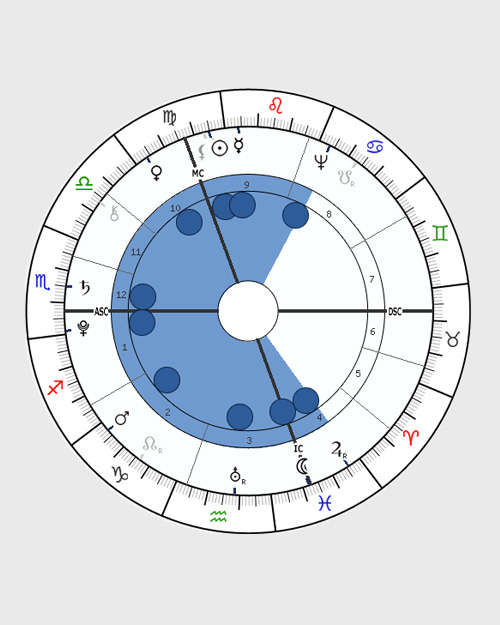 But if the shape of the horoscope is obvious (Distinct Shape), we should pay attention to it because it tells us a lot about the person´s characteristics and his or her attitude to life. All planets are evenly distributed in one third of the horoscope of about 120°. What Shape do I have? Use our Natal chart calculator to find your horoscope shape.